Farms aren’t built in a day. After a kick-off party last fall with musician Jack Johnson and his wife, Kim Johnson, and a soft opening in February, the UC Santa Barbara alums returned on St. Patrick’s Day to host a planting party at the university’s new student farm. Part of the wide-ranging food-sustainability initiative called Edible Campus, the 12,000-square-foot farm, once fully operational, will provide healthy food access for the thousands of UCSB students who frequent the Associated Students Food Bank, located in the UCen. Food pantries traditionally rely on leftover produce, and many gather from grocery stores right before food gets tossed out. This leaves students with limited options, since they have to quickly consume that produce. “What we’re doing is providing freshly picked fruits and vegetables where we can pick those items that same morning and bring them to the food bank the next day,” explained Katie Maynard, sustainability coordinator in the Department of Geography at UCSB. What will this new student farm grow? UCSB’s Edible Campus has a running wish list of 110 fruits, seeds, nuts, spices, and vegetables, from zucchini, eggplant, peppers, and radishes to yams, okra, persimmons, mint, fava beans, and more. Trees take about five years to produce large harvests, so it will still be some time before the campus sees substantial yields. 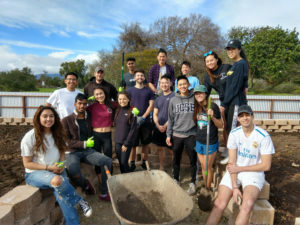 The project is managed by the Associated Students Department of Public Worms, who have welcomed volunteers from Associated Students, the UCSB student body, Isla Vista, Circle K, and the Greek system. More than 60 people showed up to plant seeds and work the garden beds on March 17. Once the farm is fully established and combined with two other campus farms — potted orange trees at Storke Plaza and a tower garden near the Rec Cen — the AS Food Bank should receive double the amount of fruits and vegetables per year that it usually gets — that’s an additional 25,000 pounds. Pretty soon, students and community members will be able to visit the farm, which is on West Campus next to the Orfalea Family Children’s Center, and learn about where their food comes from. They can even pick up a shovel and start helping. Altogether, while this farm will be feeding UCSB students, it offers endless opportunities for the public to reconnect with the land and make empowered decisions about their diets.